“Wilder than Wild” is a one-hour documentary that reveals how fire suppression and climate change have exposed Western landscapes to large, high intensity wildfires. The film goes on to explore strategies that are being developed to help mitigate the impact of these fires. 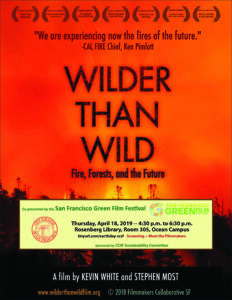 The screening at Rosenberg Library, Room 305 is part of a larger effort to engage communities in conversations about the future of wildfire. A panel featuring filmmakers Stephen Most and Kevin White will follow the screening.